Project obstacles and solutions: The University of Kentucky is in the midst of a major project that is replacing aging dormitories with new buildings. When finished, the university will have created living space for 9,000 students. Phase 2 of the project began in 2012 and included five new dorms at a cost of $175 million. 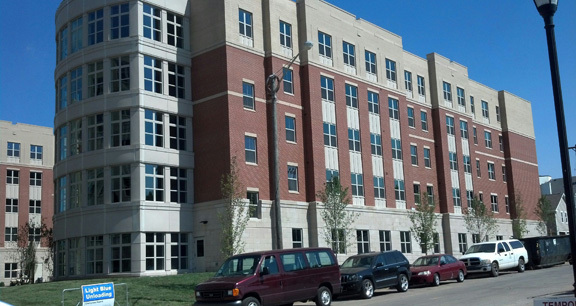 The 2014 Fall Semester sees three new dorms opening up for student housing. This includes the new Haggin Hall, a five story Living/Learning mixed-use building that will house 396 students at capacity; Woodland Glenn I and II, both four story structures housing 818 students; and Champion Court I and II. Champion Court I is eight floors and has a capacity of 740 students. Champion Court II is five floors and has a capacity of 427 students. To enhance the overall learning experience, each of the halls are designated for students in specific studies at the university. Some are equipped with first floor classrooms and retail space with upper level housing. This keeps students studying a certain major in close proximity to peers, professors, classes and labs. College construction has been shaped by many different influences. However, these projects are unique from the perspective that they are being built by a private developer who will manage the properties and share profit with the university. The Kentucky legislature approved this for Phase II of the project. Education Realty Trust was selected as the developer and they financed all of the construction. Messer Construction served as the general contractor for the projects. On a construction project of this magnitude, the speed of construction is critical. Several older student housing buildings had to be torn down to accommodate the new construction. This displacement of residents meant that the new dorms had to open on time. Living space for nearly 2,400 students had to open when the students returned to school in the Fall 2014. IMI supplied over 30,000 yards of concrete for the five units that opened for the Fall Semester. Each of the new dorms had been designed with post-tensioned concrete floors and steel as the structural base. The tendons on each of the floors had to be stretched within 48 hours of the pour. This meant that the concrete had to meet an early strength of 3,000 psi in 72 hours. To achieve this, two factors had to be considered. First, the cementitious material in concrete had to be fully hydrated. Second, the temperature had to be controlled. If concrete temps are too hot, the moisture can evaporate too quickly before the cementitious components have been fully hydrated. On the other hand, cold temps can cause concrete set times to slow down considerably. Early strength is relatively easy to achieve in warm weather when ambient temperatures are consistent with the concrete temperature. However, these pours happened in all kinds of temperatures. During the winter and early spring, Lexington experienced elongated cold spells. To keep set times consistent and achieve early strength requirements, IMI QC/QA added a hydration stabilizer to the concrete. This ensured proper hydration regardless of temperature extremes. Concrete temperatures were then adjusted to the ambient temps of the day. This kept the project moving forward, especially in extremely cold weather. In the coldest weather, a non-chloride accelerator was mixed with the concrete. In the hottest weather, adjustments to the hydration stabilizer were made to ensure proper set times. Five units have opened for students returning to school. Three more units in the Woodland Glenn project are nearing completion. The construction on Limestone I and II has begun and will continue throughout 2015.